Since graduating with a Cuisine Diploma in 2011, Annick Muller’s culinary career has flourished. 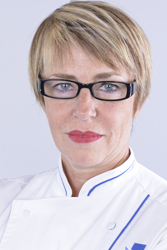 She now runs the business ‘French Culinary Adventures’ as well as participates in ‘Féminalise’ as an esteemed jury member. Annick worked in the Made in France costume jewelry sector for 25 years before deciding to change career path and focus on her passion for cuisine. She signed up for Le Cordon Bleu Paris Cuisine Diploma and, following graduation in 2011, worked in the kitchens of two Michelin-starred Chef Marc Meneau. In 2013, she decided to close her jewelry business and started a new business venture with an American friend, Nancy, who she met at Le Cordon Bleu Paris. Together, they created French Culinary Adventures, which specializes in developing and implementing top of the range culinary adventures, focusing on gastronomy, enology and French artisans, in Paris and Burgundy. Originally from Burgundy but based in Paris, Annick is an epicurean through and through and committed to sharing her passion and knowledge of the terroirs, cuisine, vineyards and geography of these regions. A wine-connoisseur, she is also a jury member at “Féminalise”, an annual competition exclusively for women who either work in the wine industry or are oenophiles.